Last week, Emily faced her roughest week of chemo yet. There are a lot of reasons for that. 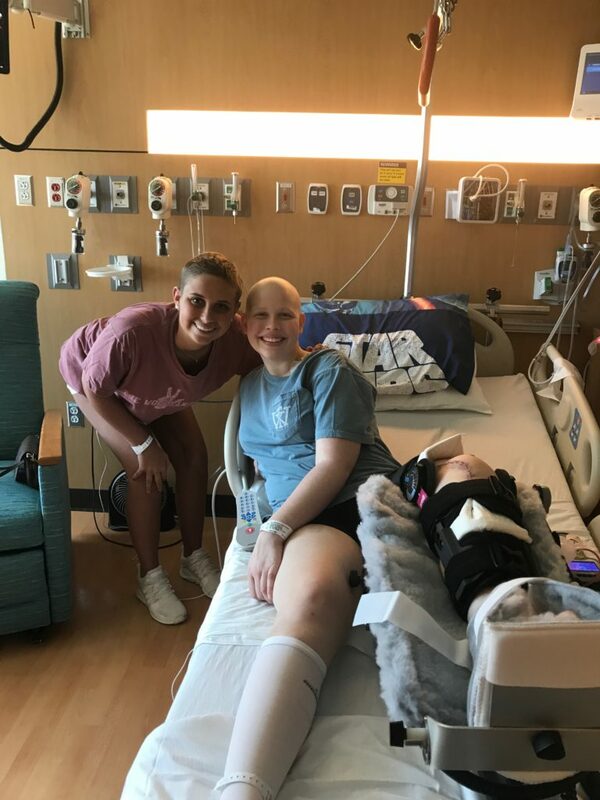 One of the primary reasons is because there was no room in the pediatric cancer center (where she always has been), so they put her on an adult floor. Not having her regular nurses that know her and having different procedures and routines helped make it a more difficult round. Also, the amount of fluids they pour into her causes her to need to use the bathroom very regularly – about every 2 hours. But now, it isn’t easy to get to the bathroom with her new knee/bone. She lost ten pounds during this past chemo week. It isn’t the most she’s lost in a week, but it is one of the larger weeks. The good news is, although the chemo round was more difficult, the recovery has been quicker. Last time, she felt sick for a week and hardly did anything. But four days into her recovery week and she feels pretty good and has been active and willing to eat. Emily has about two weeks at home for recovery until her next round of chemo starts on April 24. Until then, she goes to the hospital 3 to 4 times a week for therapy, appointments, and blood draws. This week, she has gone Monday, Tuesday, Wednesday and Friday. Next week will be similar. We are thankful that she has recovered from this last chemo round more quickly. We are thankful that she didn’t throw up during the chemo round (although she’s thrown up twice since coming home). But it is nice for her not to throw up while in the hospital. 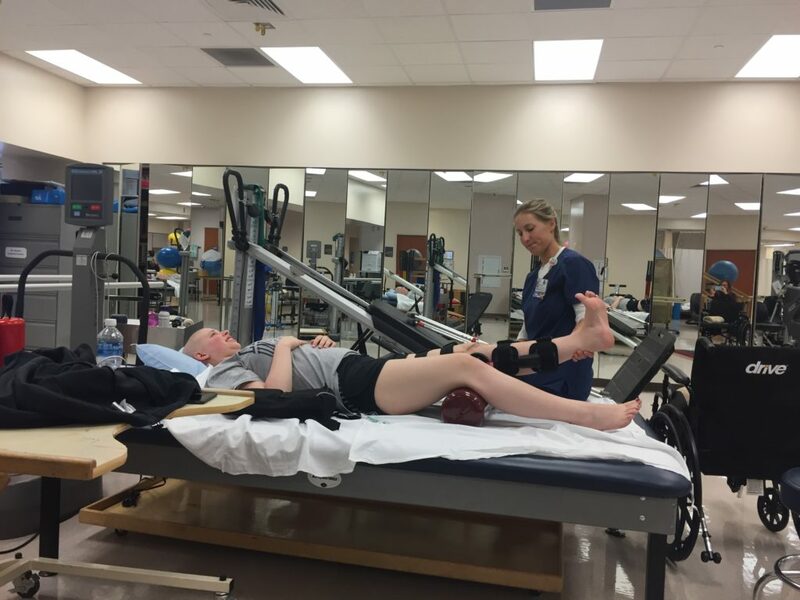 We are thankful that physical therapy is going well. They are pleased with her progress. Emily has been wanting to help children going through cancer. This week her Occupational Therapist asked her to talk to a 9 or 10-year-old boy from Greece who had gone through the same surgery as Emily. He wouldn’t do any work in therapy. So Emily talked to him about working hard even when it hurts and gave him some encouragement. A couple days later, the OT told Emily he did work for the first time after her talk with him. And a couple of days later, they saw each other and he was so happy to see Emily. Ali and her boyfriend, Justin, were able to come for a brief visit. They arrived on Wednesday and will leave tomorrow. It is a huge encouragement to Emily (and all of us) to see Ali. Ali hasn’t seen Emily since early January. Pray that Emily would stay “on schedule” for her chemo treatments so she can return to college in the fall. That’s going to be hard because with 11 treatments coming, her body and immune system are going to be wearing down. If she was never delayed because of sickness or low counts, she’d be done August 6. Our oncologist said that everyone gets delayed through this – so we are realistic, but we’d love for her to still start college again in the fall. Pray for a relaxing time off and a return to full strength before April 24. She will be starting three weeks in a row of chemo. Starting strong will help her more likely get through the three weeks without a delay. Each week of chemo, we give Emily a verse or saying to help her focus on her week ahead. This was the one we gave her this week. Logan is a year younger than Emily but about nine months ahead of her with the exact same diagnosis. She lives nearby us in the Houston area. Logan has been a great encouragement to Emily. The initial goal in therapy is to do a dead leg lift (like this one). 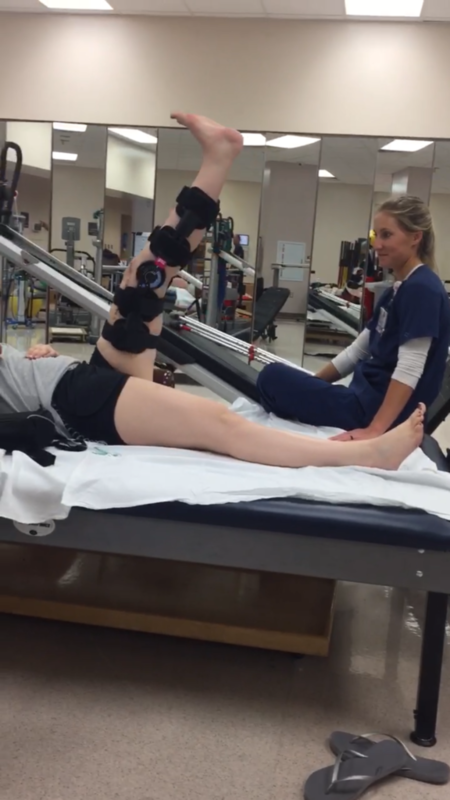 The goal was to do it by six weeks after surgery, but three weeks to the day after surgery, Emily was able to do this. 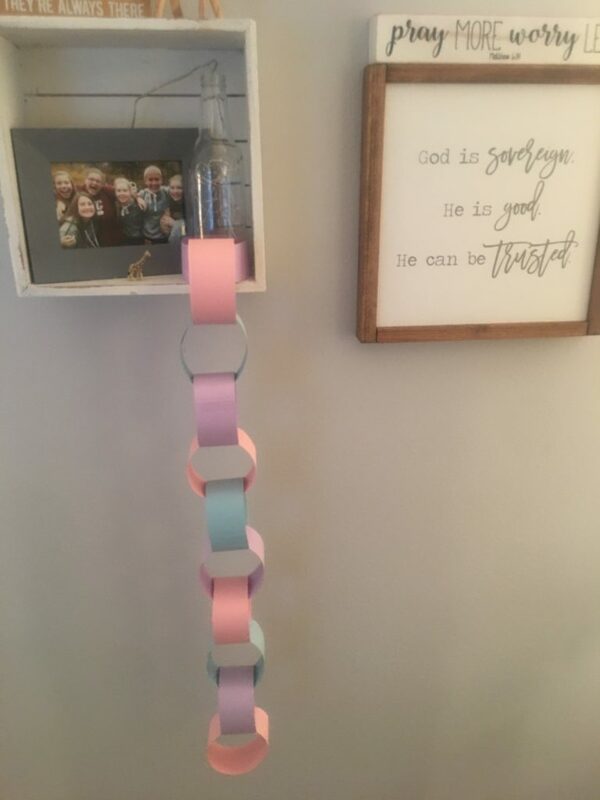 Emily decided to make an old school paper chain. There are now 11 pieces of the chain – each representing a week of chemo that is still coming. 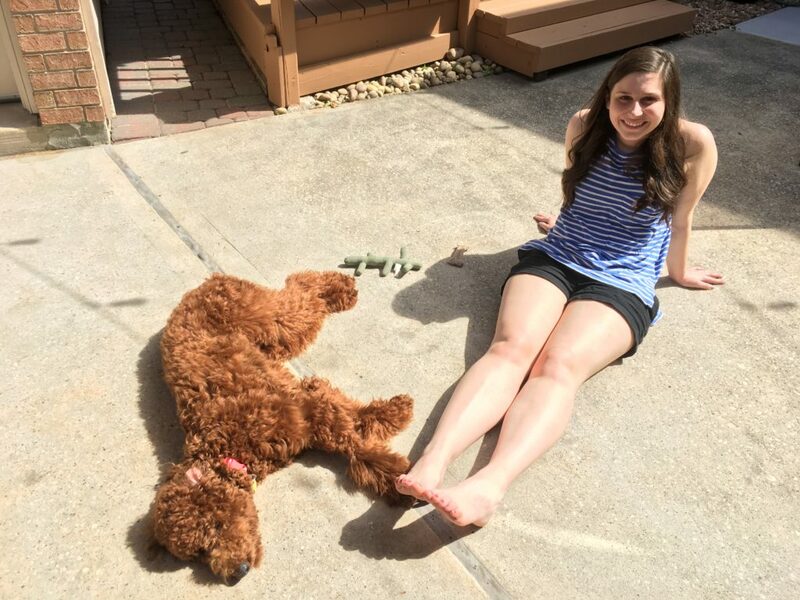 Ali is enjoying some sun time with Daisy. It is great to have Ali home for the first time since Christmas. We have a little girl In our church named Chloe—we all call her “Super Chloe”. She will be 12 on 5/9. She has a older brother, Elijah, who is 14. Her mom, Amy, says of herself: “I’m a wife, mommy, copy editor, and volunteer with the Tuberous Sclerosis Alliance. My passions are raising awareness of Tuberous Sclerosis Alliance, raising money for a cure, and fighting for the best care for my children.” tsalliance.org From the website: “What is TSC? First described in the 1880s by French neurologist Désiré-Magloire Bourneville, tuberous sclerosis complex (TSC) is a genetic disorder that causes tumors to form in many different organs, primarily in the brain, eyes, heart, kidney, skin and lungs. The aspects of TSC that most strongly impact quality of life are generally associated with the brain: seizures, developmental delay, intellectual disability and autism. However, many people with TSC are living independent, healthy lives and enjoying challenging professions such as doctors, lawyers, educators and researchers. The incidence and severity of the various aspects of TSC can vary widely between individuals—even between identical twins.” As you can see, TSC is an ongoing danger to this family as they deal with the constancy of this “orphan disease”. Orphan diseases are those diseases that do not get the same funding nor research and development as those diseases that are more prevalent in our society, which is very frustrating to the person who has it and their parents! Super Chloe has an indomitable spirit, undergoing painful testing several times of year and the specter of possible seizures hanging over her head all the time. With that as background, I am choosing to rename your precious daughter “Super Emily” because of the way she has managed to take on this journey with the evil cancer that has invaded her beautiful young self! Though I’m sure most of us struggle with the big “W”—WHY, it is refreshing to see young people who know the Lord, even the very young ones, walk in the power of the Holy Spirit through the unknown, the pain, and the suffering they endure with these evil diseases! Having been through so much with this evil cancer, I can see Super Emily putting on her robe of righteousness ministering to those who the Lord puts in her path so that they, too, may feel the love and Presence of Him Who loves her so much that He paid the ultimate price for her and the whole world with His torture, death, burial, and resurrection! Her infectious smile will put others bearing this disease at ease. The strength she’s been given to trust in the Lord with all her heart will shine through to those in need, helping to wipe away the fear of what lies ahead by being the overcomer that she has proven to be! I pray that He will strengthen her to become His voice in this wilderness place of those who are suffering that by her touch on their lives they may have His strength to rally through all that is necessary to bring about remission, even complete curing of the evil disease that they may walk in newness of life in Christ! 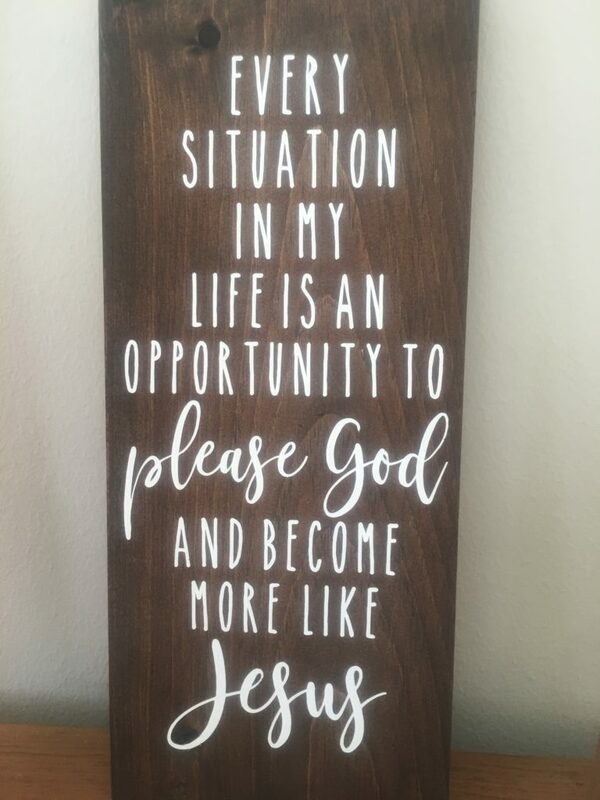 May our wonderful Father use Super Emily’s love and gifting to bring honor and glory to His Name, and May He give her a long, healthy life of serving Him for I ask these things in the Name of Jesus Christ, our Savior and Lord, Amen!